If you've ever seen a Rolls-Royce with a painted pinstripe down the side -- that long, thin dead-straight line that goes from the just behind the headlights to just before the taillights -- you're seeing the artwork of Mark Court. That's his job and his alone. A former village sign painter he now paints coach stripes, as they're properly called, on Rolls-Royce cars at the company's Goodwood, England factory. His job is the last step in the manufacturing process and if he messes up that line... He just can't mess up that line. There is no eraser that will fix it. The paint has special properties that instantly bond it to the underlying car paint. That's serious pressure, so the proper mental state is important. "This is just another car to me," he said. "If you start worrying about who owns them or where it's going, it'll play with your mind. Then you'll never do it. You just got to be able to learn to shut off and do what you need to do." He rarely takes time off because it would cause him to lose his focus. "Weekends are bad enough," he said, "because now I have to refocus and I have come back into it again." When there's time off at the factory -- when the the plant's being retooled to build a new model, for instance -- Court usually travels to various parts of the world to paint customers' cars or to display his skills in public exhibitions. Tall and burly with a thick, rolling accent, Court looks and sounds like just the sort of man who you could imagine painting English pub signs. That's what he used to do before he came here. He applied for the the Rolls-Royce job as soon as he heard the automaker would open a factory in his rural village in 2003. "For me, it was just adapting a skill that I already had to a technique for doing six meters of car," he said. Six meters is about 20 feet -- the length of a roughly $500,000 Rolls-Royce Phantom. A skill like Court's wasn't easy to find. 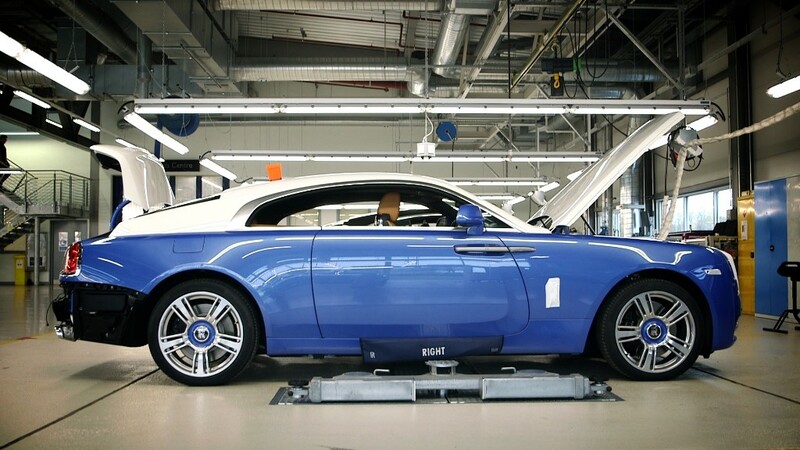 He was flown to Germany to meet with Ian Cameron, the man BMW had hired to head up Rolls-Royce design. BMW had bought the Rolls brand a few years earlier. Cameron showed him a perfect hand-painted coach line. "It was a case of 'Can you do that?'" Court recalled. "Well, I'm a cocky Englishman. I can do anything." 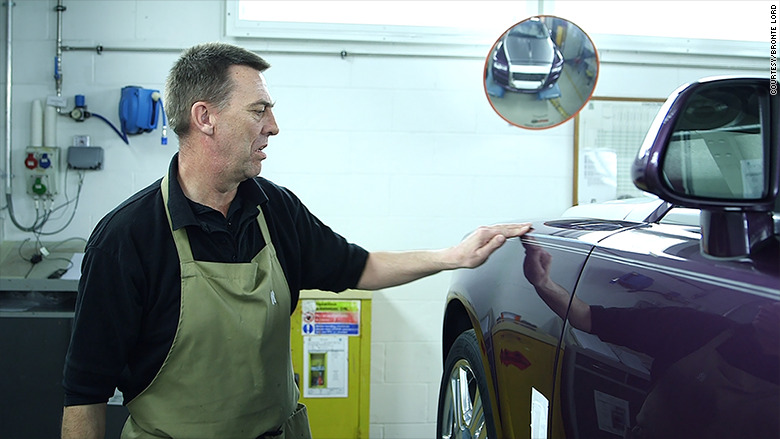 Former sign painter Mark Court now paints the coach stripes on Rolls-Royce cars at the automaker's Goodwood, England, factory. From there, Court was sent to BMW's motorcycle factory, the only part of the company, at that time, that did hand-painted lines. He perfected his craft painting gas tanks and fairings, the shell that goes over the frame of some racing-style motorcycles. Court uses squirrel hair brushes that he trims himself to just the right shape. He powders his fingers so they slide easily across the car's smooth painted surface as he follows a guide line made from tape. The tape doesn't mask the edge of the line, it's purely a guide from which he keeps a set distance. His job involves much more than just straight lines, though. Customers also request a variety of custom designs including flowers, horse heads, various abstract shapes and, of course, their initials. He spent hours painting lines and flowers on Rolls-Royce's Serenity show car that was unveiled at the Geneva Motor Show this year. He's still trying to find an apprentice to someday take his place. So far two apprentices have dropped out. One was his own son, who decided to go to work in Rolls-Royce's wood shop, instead. "Time marches on," Court said. "I ain't getting no younger. Someones got to continue."